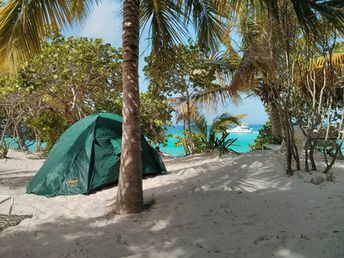 This beach ranks #2 of the "Best beaches in Jost Van Dyke island"
The campsite can shelter few tents. Also there are dozen of inexpensive bungalows here. We advise to book in advance in high (winter) season. At other times, you can come without a reservation. Keep in mind that property owners usually leave the campsite in the evening and come back in the morning. Fly to St. Thomas Airport. Next get by boat from Red Hook pier to Jost Van Dyke island. More details - here.